Killer Characters: Do You See What I See? We haven’t met before. I’m usually a pretty quiet guy: until recently I lived alone in a Victorian fixer-upper I never have time to fix up; I manage a small scientific testing company I founded a few years back; and I spend my spare time doing some genealogy research (my family’s lived in the same part of Massachusetts for centuries) and giving tours of local historical sites. That’s how I met Abby Kimball. I wouldn’t have said more than “hello” and “if you have any questions, just ask,” when she walked into the local mansion I was babysitting during a town-wide house tour event, but then she kind of passed out in front of me, so of course I had to make sure she was all right. And that’s what opened Pandora’s Box. Or something like that. You see, it turns out that we both see our dead ancestors. Oh, and in the interest of disclosing all the facts, Abby and I kind of fell in love along the way. She moved in with me in that fixer-upper a couple of months ago. That first meeting was—wow, almost a year ago now. It’s been a strange and interesting year, and I think Abby has helped me as much as I’ve helped her. And once we both accepted that we had this odd ability, we’ve been able to use it more (and when we join forces, we’ve found we kind of boost this ability for each of us). 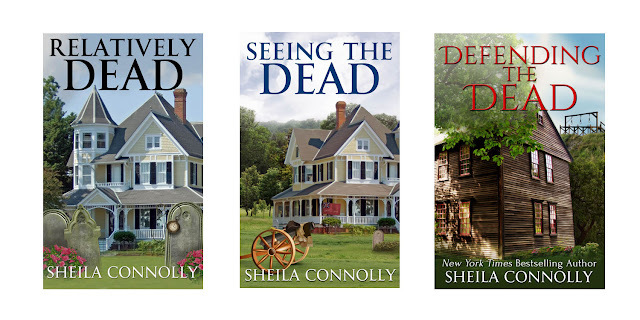 Seeing the dead is nothing to be afraid of—they can’t hurt us, and their lives are behind them. It just takes some getting used to. Particularly because they keep showing up when we don’t expect them. It’s good that we have each other to confirm that we’re both seeing the person who isn’t there, except I think Abby has more ancestors in the neighborhood than I do, so she sees some that I don’t. It’s very confusing. And we haven’t found many other people who share this—yet. We’re going to take a quick vacation on Cape Cod this month. I don’t know of any ancestors there, but I’ve been surprised before, especially when Abby is around. There will be a new book in the series coming this fall--just as soon as Ned and Abby get back from Cape Cod! Available in ebook formats at Amazon and Barnes & Noble. these sound great I will pick them up! Enjoy your vacation Ned. Look forward to reading the upcoming one. Ned spends an awful lot of time working, so he can use a break with Abby. And the Cape is lovely, as long as you stay out of the way of the tourists. The one time I went to Cape Cod, the hardest part was getting there--traffic, wow! What a fun series! I like Ned. My husband commutes over one of the bridges daily for work. In summer, forget about Friday afternoons and Monday mornings (there's a rotary on the Cape side that fouls things up in any direction). But there are some sneaky back ways. The rest of the year it's delightful. I haven't read any of this series yet. They sound good! I find this a very interesting series. I just think it would be so wonderful to be able to see and maybe speak to our ancestors. Ned and Abby are a great couple. I look forward to more books in this series. If we believe that bats can hear sounds we humans don't, and dogs can smell over a far bigger range than we can, why not hope that some people can "see" something left behind by their ancestors? I'm still hoping--although they do lead me to some very interesting places.